We are closing in on the conclusion of our "Season in Review" series for this season; and the evidence of that is that we now turn our attention to determine how Pittsburgh's offense performed by down (i.e. first, second, or third) and distance. What we see in the numbers is a renewed emphasis on passing the football in the early downs (a la 2006). The total number of first down plays in 2008 was the fourth highest of the past nine seasons, and the number of passing plays was also the fourth highest during this period. 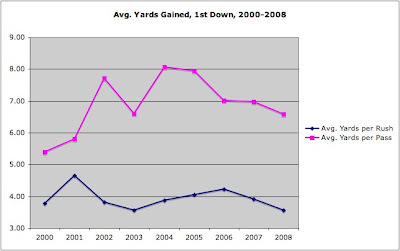 However, despite having fifteen additional first down plays in 2008 as compared to 2007 the number of rushing plays declined. We can only guess as to the reason(s) for this trend, but the guess here is that the extraordinary number of sacks suffered by Pittsburgh quarterbacks must factor in to the play calling. The first down rushing average in 2008 (3.56) was the worst in the past nine seasons, and the passing average (6.58) was third worst (in 2000 the Steelers' passing average on first down was 5.4 yards, and in 2001 in was 5.81). Stated bluntly, on first down during the 2008 season the Steelers' offense stunk. What impact this ineffectiveness had on successive downs we will see in the coming days.